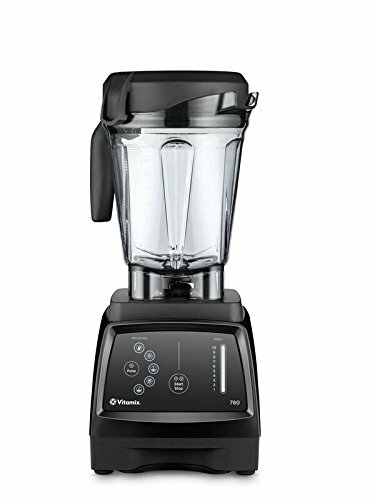 Trying to figure out the difference when comparing the Vitamix 750 vs 780 Professional? Also confused on which one to buy? You're in the right place! An easy to follow comparison chart that shows the biggest differences between the 750 and 780. Which one you should buy based on our 7+ years of Vitamix blending experience. Mobile users can scroll left to right on their screens. Touchscreen panel with 5 pre-programmed functions and variable speed slider. Variable speed dial with 5 pre-programmed settings built in. Both the 750 and 780 Professional come with a 2.2-Peak horsepower motor. This motor, complimented by the tamper and the way the blades and jar are designed, is more than powerful enough to meet all of your blending needs. ...And both motors are enough to do all that and much more. Long story short, you don't have to worry about the motor in either of these blenders. They're both the same power and more than enough for anything you want to create. The controls and interface are the biggest difference between these two blenders, so that's what we'll spend the most time on. Variable Speed Control: One of the first things you'll notice is that the 750 has a knob to control the speed of the blades while the 780 has a slider mechanism (over on the left). They've both got the same speed ranges, it's just a matter of how easy it is to change the speeds. Personally, I'd prefer the analog knob mechanism, but it just comes down to your preference. Pulse Function: The second difference is how you control the pulsing of a the machines. When you pulse, the blades will do a brief spin rather than a full cycle which gives you the ability to rough chop ingredients. Needless to say, the 780 has a touch button while the 750 has the more traditional switch. Both do the same thing, but the mechanism to activate them is slightly different. Pre-Programmed Cycles: Both of these blenders have pre-programmed cycles and they happen to have the exact same ones - Smoothies, Frozen Desserts, Soups, Purées, and a Cleaning Cycle. Again, its simply a difference of how you activate them. The 750 programs are activated by turning the dial while the 780 is activated by the push of a button. Do note that both of these machines can perform the programmed functions manually. The instruction manual advises you on which manually speeds to use and for how long. For that reason, I'm of the opinion that it's not necessary to have these programmed cycles to begin with, but many people swear by them for the slightly added convenience of being able to walk away. Ease of Cleaning: This is where the design of the interface makes the biggest difference. Looking at the two blender housings, which one do you think is easier to clean? If you guessed the 780, then you're correct! That's because of how flat the interface is. It's much easier to wipe it down rather than worrying about getting in the nooks and crannies of knobs and switches. However, unless you're splattering stuff everywhere, this isn't something you'll have to do that often -- but it is something to take into consideration. Both the 750 and 780 Professional come standard with a low-profile 64-ounce jar. Low-profile 64 ounce Vitamix jar. 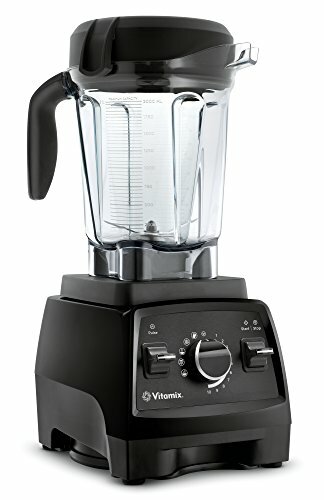 Vitamix has been making 64-ounce jars for some time now, but the low-profile design is a bit newer. They're around 3-inches shorter than the Classic Vitamix jar. One obvious advantage to having the low profile jar is that it can fit easily under a low-hanging cabinet. This makes storage of the Vitamix much easier, especially if you've got a small place. The other advantage is that the wide blades are great at creating a quick vortex, even when the jar is close to the mix fill line. It's GREAT for large batches. The downside is that it requires a larger volume of ingredients and liquid to make small batches effectively. With the more narrow 64-ounce container, it doesn't take much to get the liquid passed the blades. That said, you can always get a smaller container (from the link above to Vitamix Accessories) if you find yourself struggling with smaller batches. The 750 has a neat array of different color options outside of the standard black and red. Not necessary unless you have a specific design aesthetic in mind for your kitchen, though. These two blenders both come with the famous Vitamix 7-year warranty. It really is as good as people say it is. Vitamix is one of those rare companies that actually stands firmly by their products. I've only had positive issues dealing with their warranty support (and honestly some of the things they fixed for me were my fault - not to say they will always do that). Both the 750 and 780 Professional come with the same low-profile tamper. And it's awesome that they do! The tamper is arguably the best part of any Vitamix. It allows you to push the ingredients into the blades during the blending cycle rather than having to stop and take the lid off. It makes forming a vortex so easy and efficient. I've read several other blog posts that compared these two blenders and took measurements on which is louder. However, I don't think that should be a major buying consideration for either the 750 or 780. It's important to note that both of these blenders are going to be loud machines. They're blenders with powerful motors! If noise is really your top concern, then consider going with a Vitamix Quiet One. Even though it's a commercial product, you can still use it on your home if noise is of paramount concern - although it wouldn't be my first pick because of the extra cost. Again, the two MAJOR differences between the Vitamix 780 and 750 are the touchscreen display (780) and the different finishes that they come in. The 750 is designed with a bit more aesthetic in mind with the copper metal and brushed stainless finishes while the 780 is only manufactured in black and red. Other than that though, the blenders pretty much have the same functions. They even have the exact same pre-programmed settings, it’s just that the 780 is activated by a touchscreen while the 750 requires turning a knob to get to them. Honestly, I would take the 780 over the 750 simply because ease of cleaning the interface if I absolutely had to pick one of them. The MSRPs on these units aren’t too far apart, so you’re unlikely to save a bunch by going with either one. See current prices on the 750 here and 780 here. If you’re looking for something a little more manual, then I’d recommend checking out a refurbished 5200 or something from the Explorian series so you don’t have to pay for the extra programmed functions on the 750.